Hello, my dear friends! How are you today? 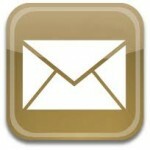 I hope you had a great weekend and are recharged for this Blessed week that is just starting! 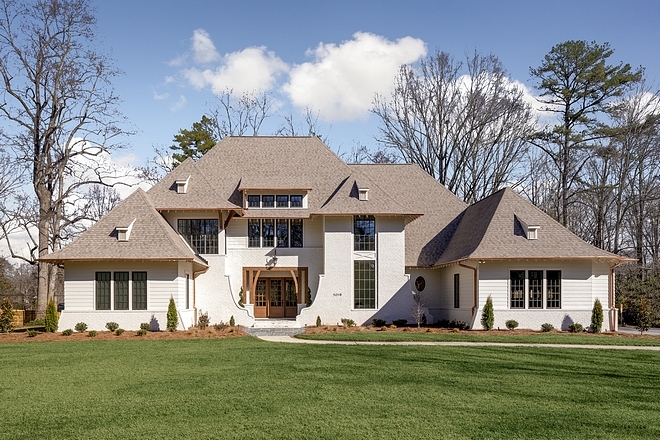 I am very excited to be sharing this extraordinary home built by this very talented North Carolina building company, Pike Properties LLC (previously featured here, here, here & here). 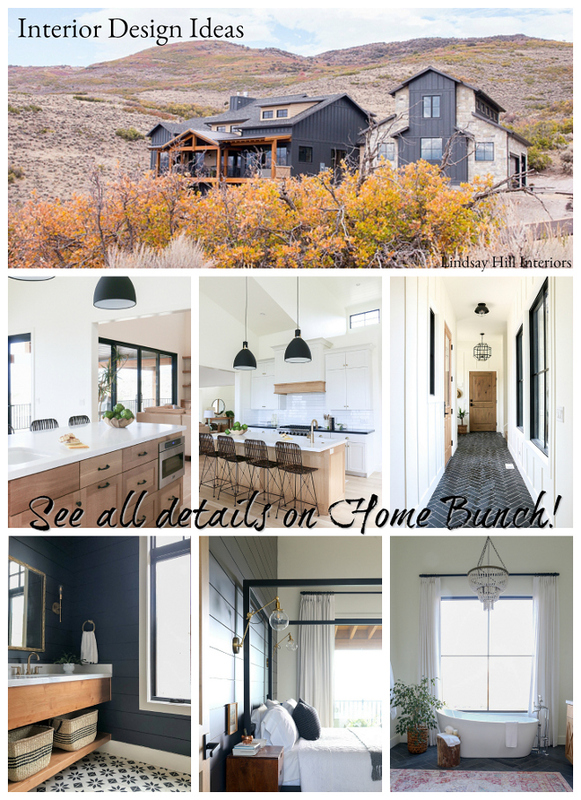 Here, the builder explains more about the process of creating this Belgian-style modern farmhouse, which I hope inspires you! 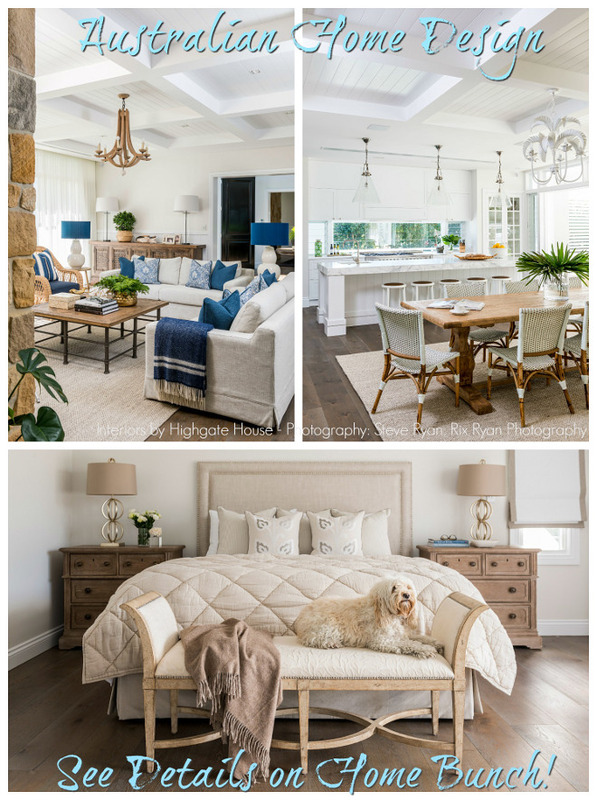 “The style is what we like to call modern-traditional. It is a mix of elements of traditional home design and modern flair to create the “perfect” combination. The expansive footprint was a must considering the lot we had to work with was 200+ feet wide. The idea was to create a home that made a statement and made it’s presence known, but that wasn’t overwhelming or imposing. We didn’t want a McMansion, we wanted a livable homey finished product that was elegant yet humble. Take note of the curved rafter tails. This is an expensive design upgrade but allows for the home to feel more welcoming and less tall and closed off. Its in small details like these that a masterpiece comes to life. Feel free to pin, save and share this beautiful home. Photography is by Joe Purvis. 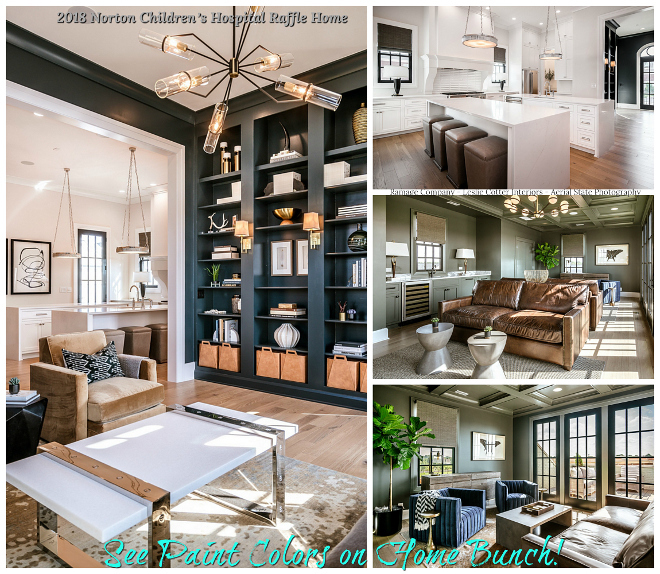 “It all started with this moment… After acquiring a prime homesite in a community we have been building in for quite some time now, we knew it was our opportunity to design and build a truly unsurpassed and exceptional home. 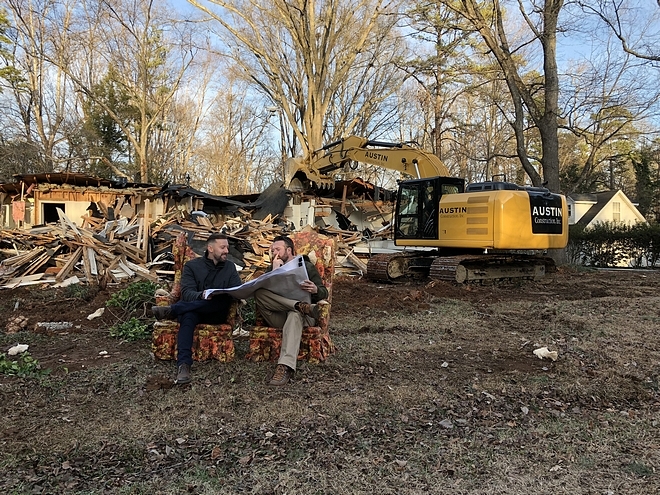 Pike Properties likes to build 1 home per year that tests the limits and pushes them beyond anything they have ever done before, and this was their chance for 2018. 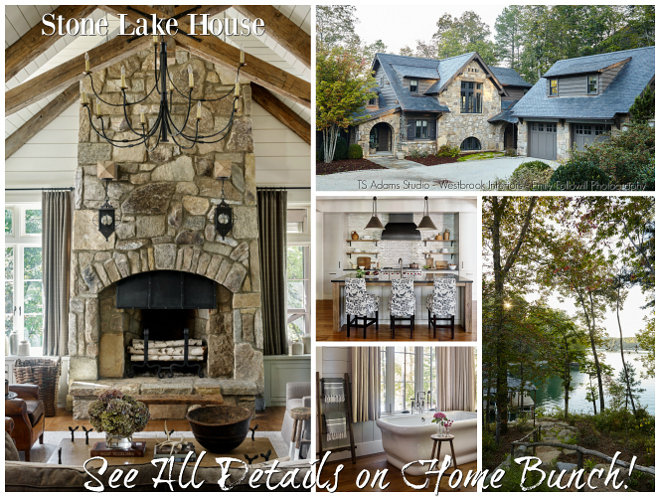 Why was this homesite so special? 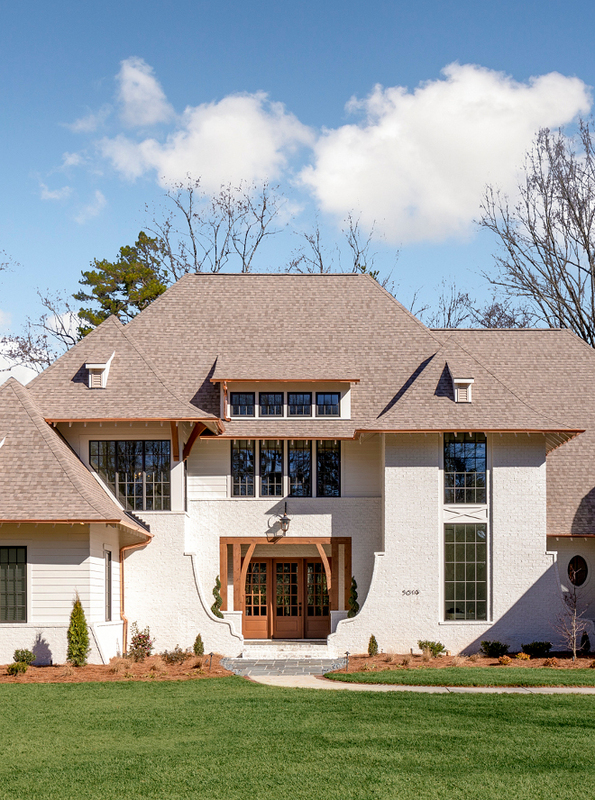 It was tucked away down a private road and situated on over half an acre of flat land which is pretty large and rare for the area being only 15 minutes from the heart of uptown Charlotte. Fun fact: We built our 2017 showcase home just down the street from this property! See it here. This was the end result of 10 months of building plus an additional 2 months in planning and design. What you see here is a home that meets and exceeds the wildest of expectations and is truly an exceptional piece of craftsmanship. Size: 5,700 Square Feet – 5 Bedrooms – 5 Bathrooms. Gas Lantern- CopperSmith Adams Street – similar Here (gas) & Here (electric). Shingles- Certainteed Landmark in Sunrise Cedar. 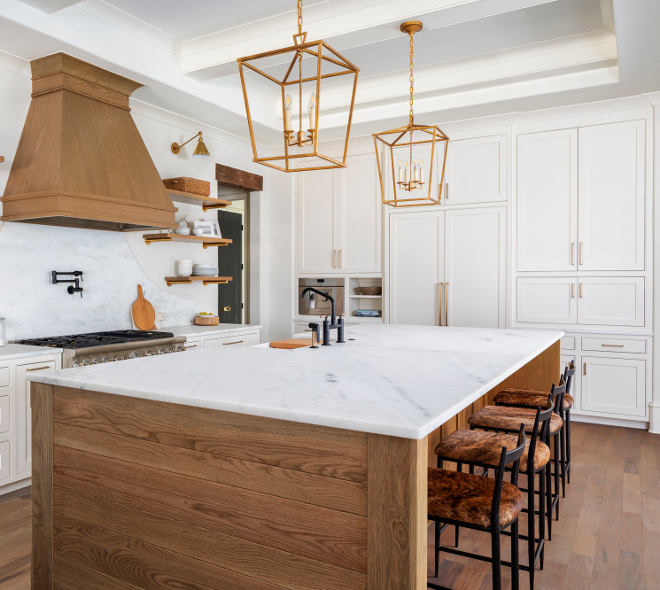 Natural wood tones, brass, and striking super white marble all mix together in harmony to create the most dreamy kitchen in Charlotte! It would have felt too cold if we didn’t bring in some of the wood elements. 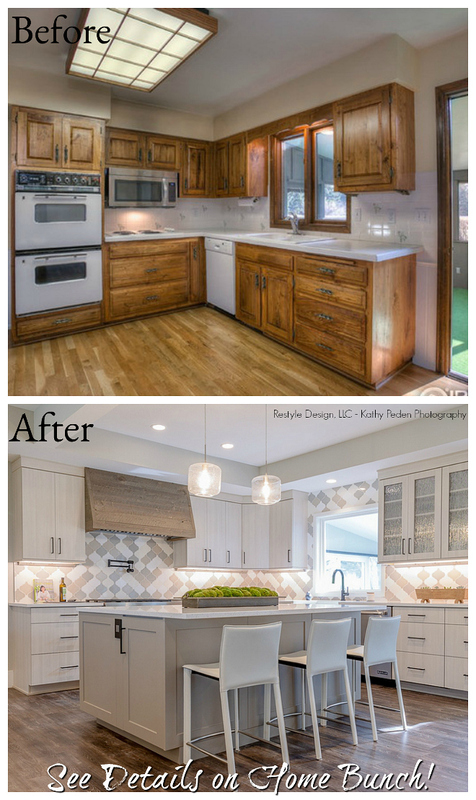 Even if we just did the wood toned island cabinetry, but didn’t bother with the shelves, range hood, or reclaimed headers. However, by implementing all those elements it made for a warm and cozy kitchen out of one that could have gone the other way given it’s vast scale. Take a peek through the left cased opening, that’s the scullery. We will go into more detail about that in a bit! Counterstools: Gabby Home – Other Beautiful Counterstools: here, here, here, here & here. 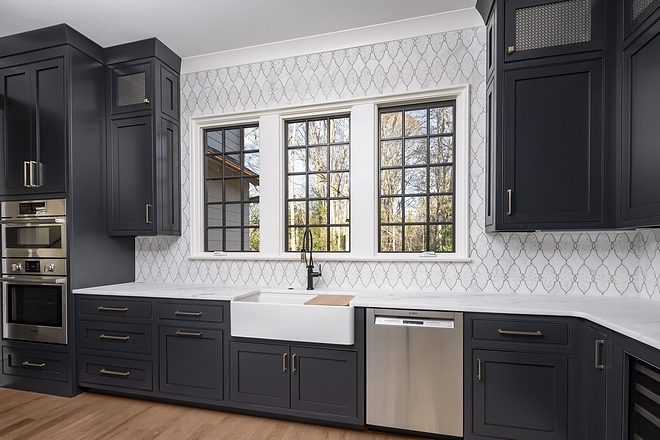 Custom inset cabinetry fills this kitchen and provides for ample storage space. 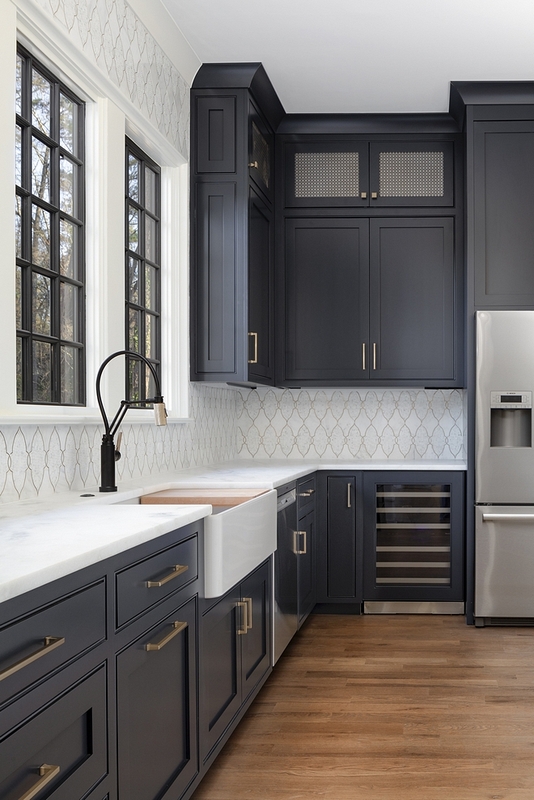 A cabinet front Thermador Refrigerator is hidden where the tall pair of doors are on the center of the wall of cabinetry. Take note of the built in espresso machine perfect for all of the coffee lovers of the world. That is one of the many first class features that you will find in this home. A chef’s dream, the 48″ commercial dual fuel range with traditional oven and steam oven, plus a handy warming drawer is the heart of the kitchen! Main Cabinetry Color- Benjamin Moore White Dove. Refrigerator- Thermador 24″ Fridge/Freezer Panel Ready Columns set together for 48″ wide package. Espresso Machine- Thermador 24 Inch Built-In Coffee Machine – similar here. 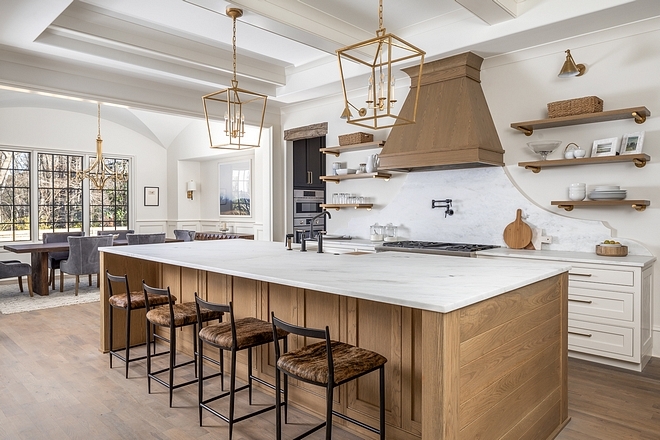 Pendants- Visual Comfort in Gilded Iron – similar here (affordable option). 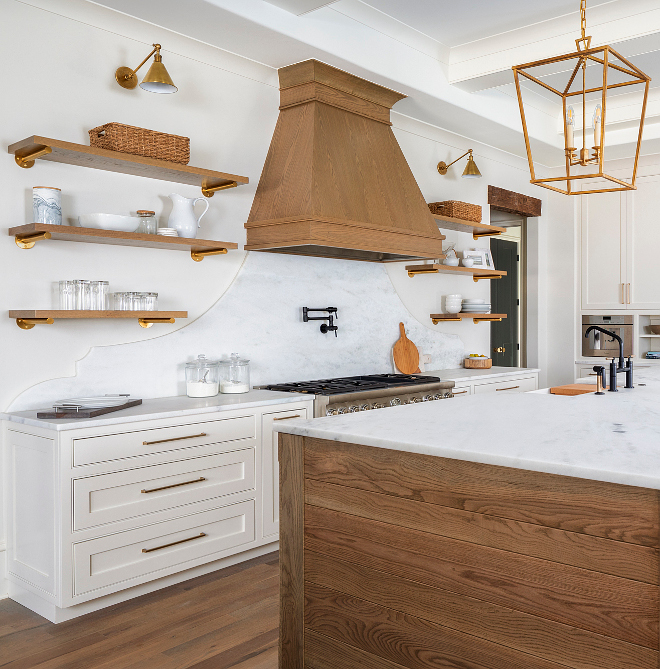 The same super white Carrera Marble that blankets the countertops heads up the wall making for what is just about worthy of being called a piece of art! We flanked it with the open shelving to soften the space and provide a perfect spot for displaying fine china. 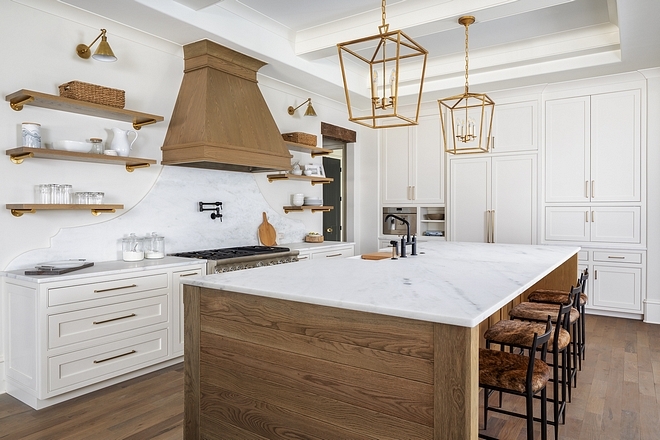 Hardware: We used Emtek Satin Brass hardware throughout this kitchen. Sconces- Visual Comfort in Hand Rubbed Antique Brass – similar Here (affordable option). 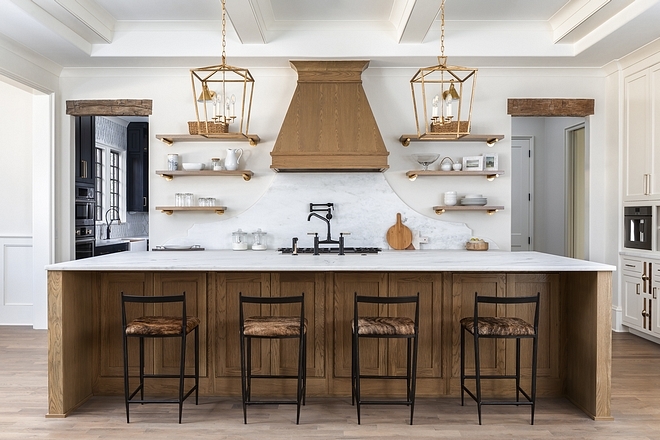 Similar Brackets: Here (matte black) – Similar Floating Shelves: Here. 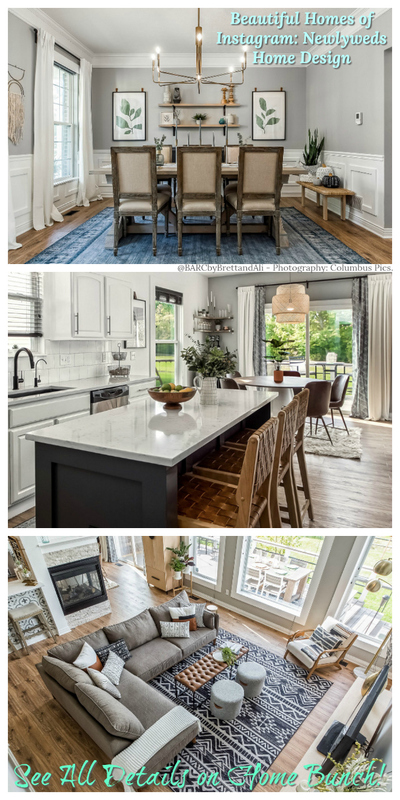 We love this angle of the kitchen because it shows the open concept to the family dining room. 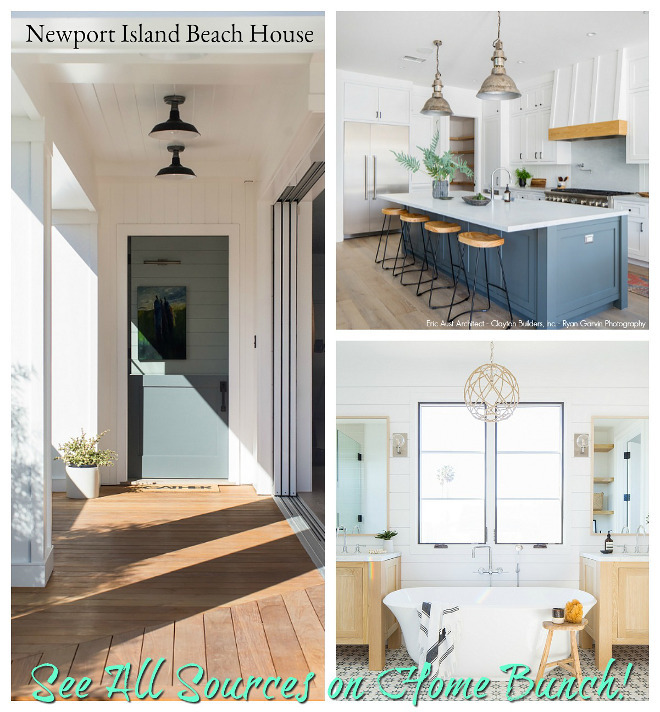 A cased opening allows for each room to remain its own space, while still keeping the open concept buyers demand in this day in age, and allowing plentiful natural light to flow into the kitchen. Floor- White Oak in Rubio Havana/White Finish – similar here & here. Let’s start at the top with the ceiling. This ceiling detail is known as a groin vault, and is very rarely found in homes overall, and if found usually only in multi-million dollar residences. 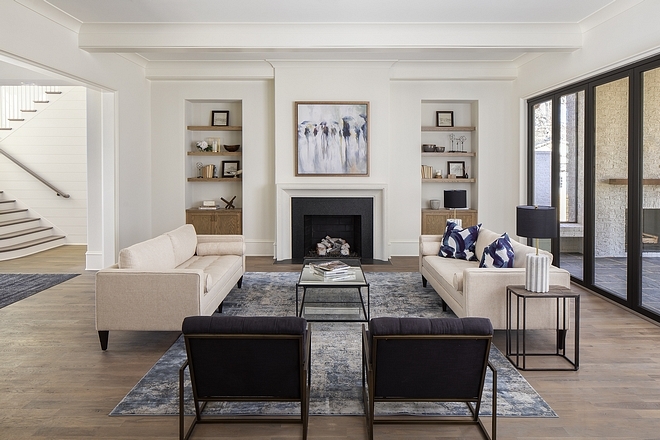 This home is valued at close to 2 million, but even so this type of extra WOW factor wasn’t necessary, it was just what we wanted to do to create a true masterpiece. Groin vault ceilings originated in the early days of Roman architecture, and are essentially two barrel vault ceilings that intersect at 90 degree angles. The framing for this piece was bought as a kit and assembled, then drywall was watered down and shaped to perfectly and smoothly form the curves and angles. The Visual Comfort Chandelier in Antique Burnished Brass is the perfect fixture to continue the visual interest downwards. This photo is also a nice spot to point out the dark window mullions/muntins. They are painted in the same color we used for the interior doors, Sherwin Williams Iron Ore, and the look is just so clean and perfect. Not only does it provide a nice contrast, but also it allows the eyes to not be as distracted by the grids making for a more seamless transition from indoors into the natural world outside. And of course, wainscoting trim rounds out this dining room. 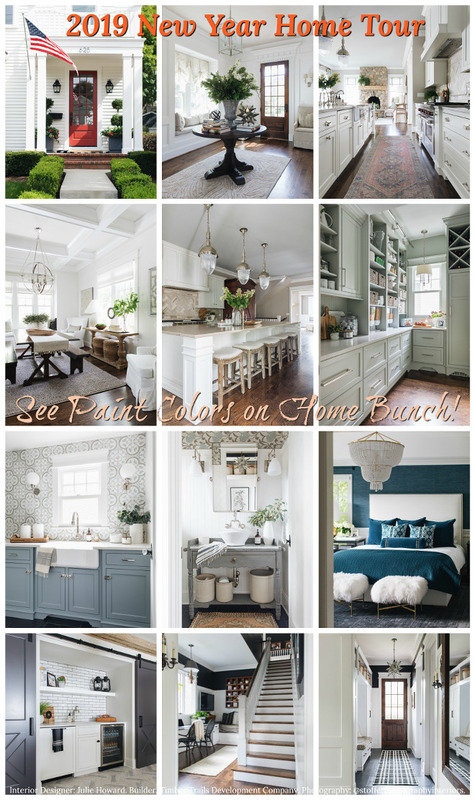 Dining Table: Here & Here – similar. 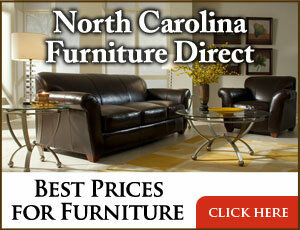 Beautiful Dining Chairs: Here, Here, Here, Here, Here, Here, Here, Here, Here, Here & Here. Wine Fridge – Thermador Freedom Cabinet Front – similar here. Refrigerator- Bosch 800 Series French Door Bottom Freezer. Dishwasher- Bosch 300 Series 24″ Recessed Handle Dishwasher. 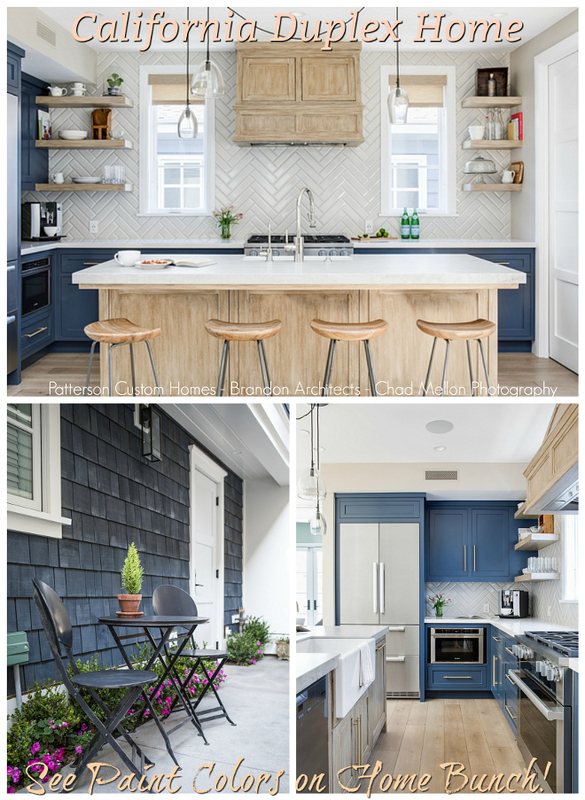 Luxurious Backsplash Tiles: Here, Here, Here, Here, Here & Here. Here you can get a perfect view of the striking tile accent wall! The convection ovens to the left above the traditional oven serves both the scullery and main kitchen, so it is strategically placed over near the opening to the kitchen. A pantry is also tucked our of view across from the ovens. Ovens- Bosch 500 Series 30″ Microwave Combination Oven. This is an indoor/outdoor living space that we like to say evokes “California lifestyle” vibes. The wall of glass to the right can open up fully and completely to the outdoor screened terrace. That way, on beautiful North Carolina days you can brings the outdoors in and listen to the birds chirping as you read a good book on the couch. The doors are manufactured by Panoramic Doors and are a 15′ wide set with 5 panels that fold over one another all the way open. This is even better than a sliding set of doors or other variation of these fully opening doors that are out there because you actually don’t have any glass remaining. They fully and completely fold out and away so the whole cased opening is completely free of glass separated the indoors from the outdoors. An Isokern gas fireplace anchors this room and is surrounded by black Granite with a Cast Stone mantle. Sleek and clean for the win! Built in bookcases/shelves are in the same natural wood as the kitchen island and range hood on the opposing side of this open concept space. Here is also a good opportunity to draw attention to the floors. Throughout this home you will find 4″ White Oak grade 1 floors finished off in a Rubio eco-friendly durable finish. The color is 2 parts Havana and one part White. 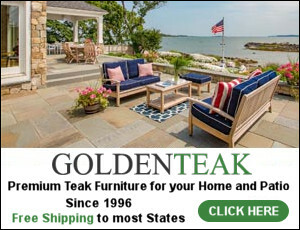 Sofas: Wayfair – similar: here. Coffee Table: Here – Other Beautiful Coffee Tables: here, here, here, here, here & here. Metal Base Chairs: Here (similar) – Other Accent Chairs: here, here, here, here, here, here & here. Rug: Here, Here, Here & Here (in grey) – similar. A home of this magnitude requires an owner’s sleeping quarters that is just as amazing. This space is really two rooms in one, the bedroom and an office/sitting room. The glass paneled sidelights allow for both spaces to feel completely unique. Just a cased opening alone wouldn’t have felt that way. In addition, each room has a vaulted ceiling! 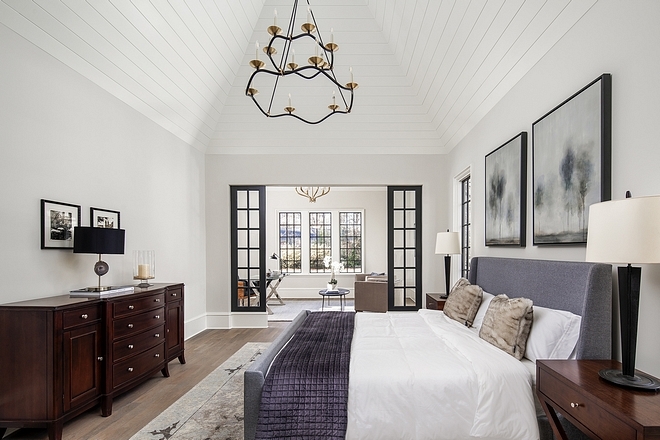 We went with painted V-groove ceiling trim which looks sleek and clean but was the added pop we needed to take this from great to extraordinary. Chandelier– Visual Comfort Choros Two-Tier. Sidelight Paint Color- Benjamin Moore Iron Ore.
From the moment we laid eyes on the 2D plans for this bathroom, we knew it would be a sight to see. The newly in trend paneled glass encapsulates the shower and makes it into its own room, quite literally. There are two entry doors on opposing sides. As you can also see, bi-fold windows open out onto a private courtyard garden. Marble mosaic tile lines the shower floor, and marble subway tile lines the shower walls from floor to ceiling. The curved wall is mirrored on the opposing side and a striking barrel vault ceiling connects the two. 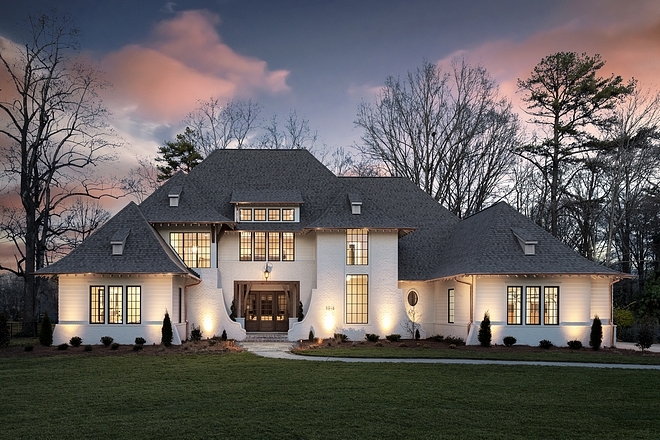 The barrel vault is accented with custom trim detail and is lit by LED strip lighting tucked underneath a grove. The round freestanding acrylic tub blends in perfectly with all the curves and is surprisingly light enough for two people to lift with ease! Elegant marble floors span the spa bathroom retreat. Chandelier- Visual Comfort Studio Venetian. 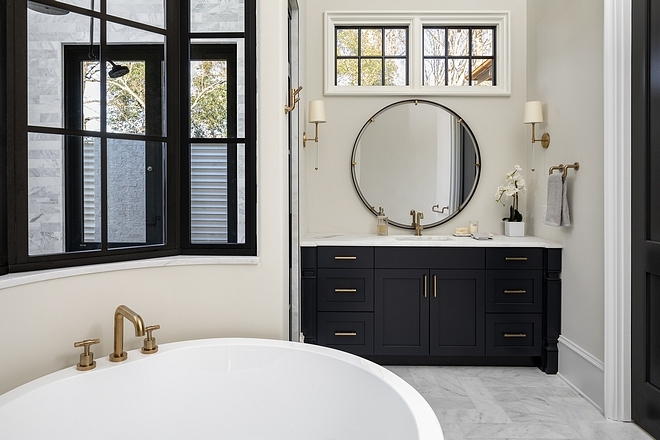 A 100 pound Restoration Hardware mirror (round to match the tub and other curves) has the necessary scale and grandeur for this space. 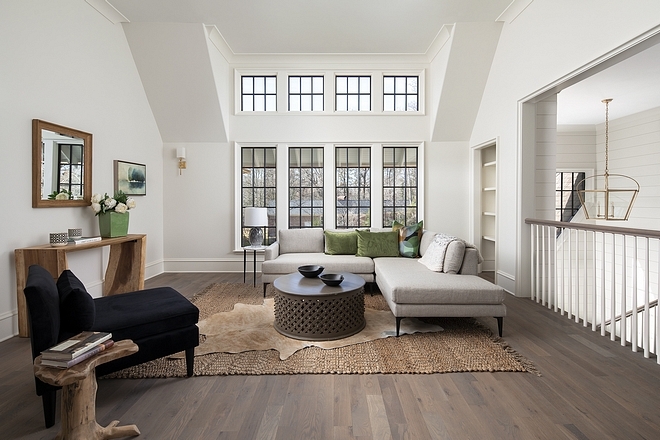 Abundant natural light is allowed to flow into the room from the transom window above. Mirror- Restoration Hardware Niccolo – similar here, here, here, here, here & here. The vanities in this bathroom were custom crafted by a local cabinet maker who also manufactured the kitchen and scullery cabinetry. 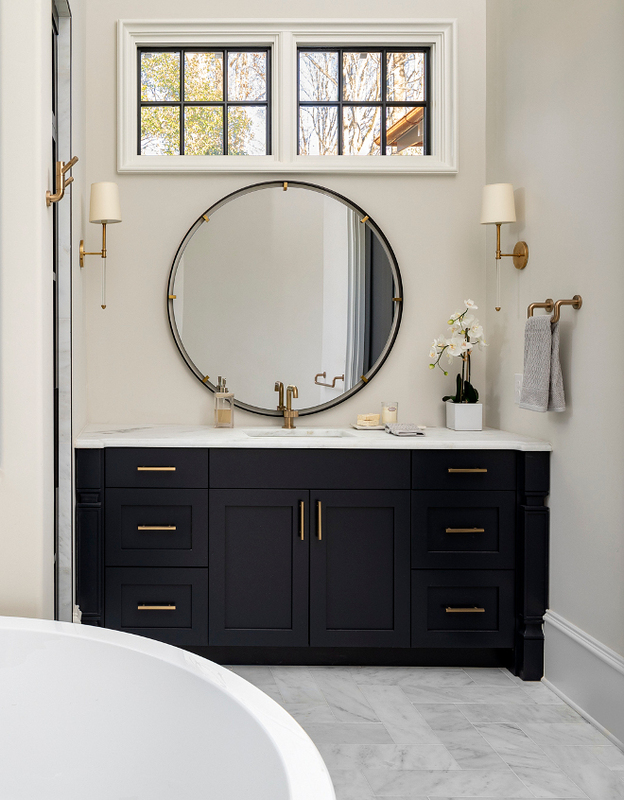 Topped with Carrera Marble and painted in Benjamin Moore Soot the vanity just POPS. Vanity Paint Color: Benjamin Moore Soot. Vanity Sconces- Visual Comfort Camille. Bathroom Accessories (Towel Bar, etc): Brizo. A shiplap lovers heaven on earth! 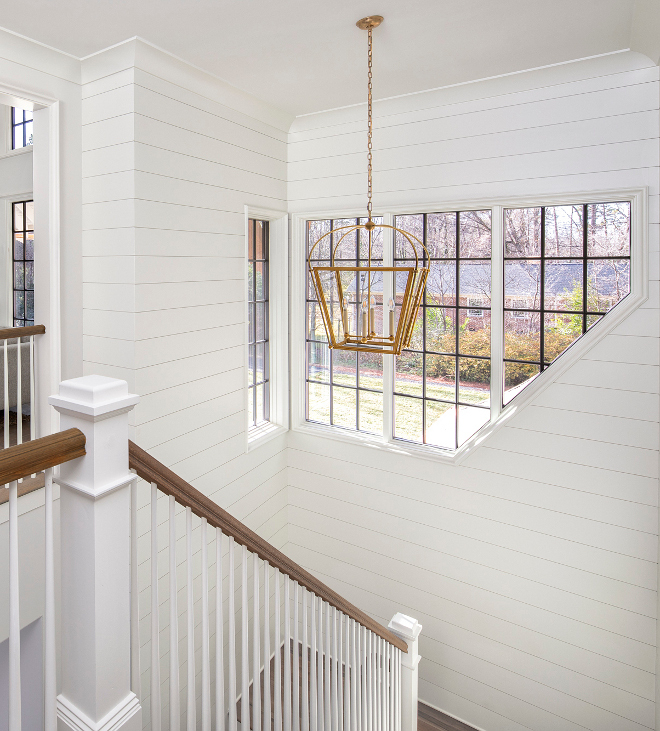 A grand U-shaped staircase with floor to ceiling shiplap takes you from the first floor up to the second! A unique pentagonal shaped window set brings in amazing afternoon sunshine! 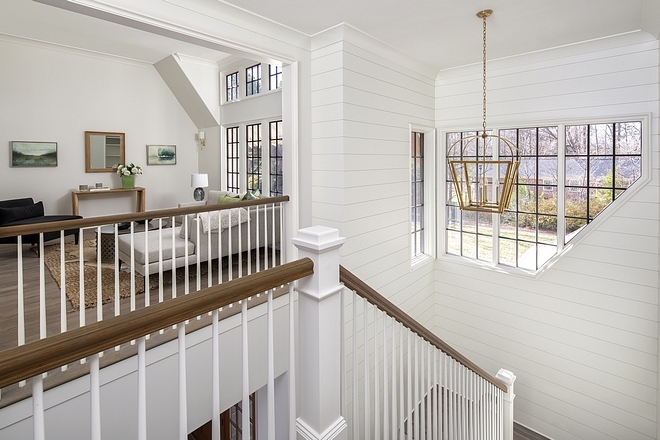 Shiplap Paint Color- Benjamin Moore White Dove. Pendant: Visual Comfort 4 Light in Antique Burnished Brass. As you traverse the second floor you soon come across this cozy loft space. Ideal for reading a book, game nights with family and friends, or causal TV watching, this space offers a variety of potential uses. This is another great shot to take in the beauty of the White Oak Floors. Similar Coffee Table: Here, Here, Here, Here, Here & Here. 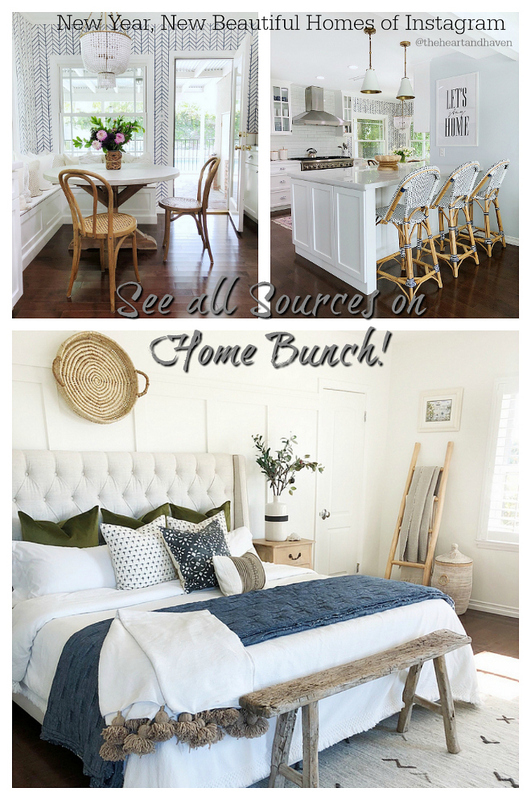 Similar Console Table: Here & Here – Other Beautiful Console Table: Here. Exterior Paint Color- Mountain 971 by Benjamin Moore. This home is beautiful. Clean and crisp, yet welcoming. Love it. Thanks for sharing.